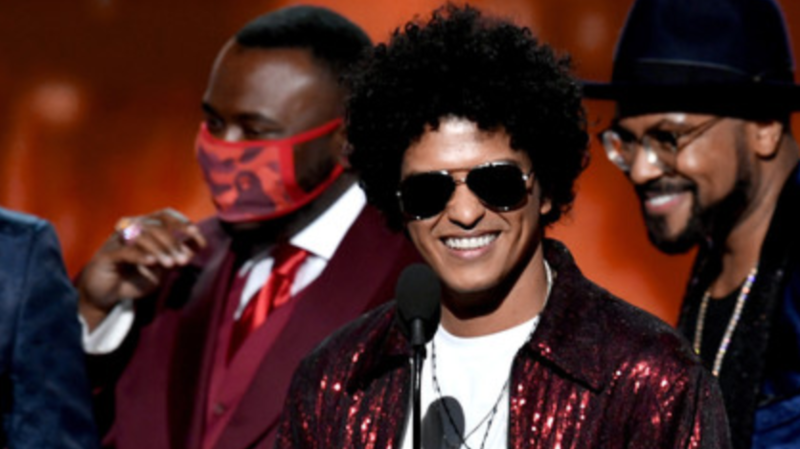 BRUNO MARS took home top honours at the 60th annual GRAMMY Awards. The Hawaiian-born Singer/Songwriter for his Tracks 24K Magic, That’s What I Like and Album 24K Magic, won Album of the Year, Record of the Year, Song of the Year, Best R&B Performance, Best R&B Song and Best R&B Album. Mars says, pleading not to be cut-off during his speech in which he recalls performing at the age of 15, “Babyface, Jimmy Jam & Terry Lewis, Teddy Riley wrote many of the songs I’d be singing. I remember people who’d never met each from two sides of the globe all would be dancing and all I wanted to do with this Album was to see everybody dancing and everybody moving. I’d like to dedicate this award to my heroes, these teachers who laid down the foundation.”. Taking place in New York City this year, the GRAMMYs took place at Madison Square Garden after having been in Los Angeles for the past 14 years. Funnyman James Corden filled hosting duties and his parents Malcolm and Margaret even came out again to support him, joking they snuck-out to see Hamilton while the show was going on! New York native and 14-time Grammy Winner Alicia Keys stated upon presenting Record of the Year to Bruno Mars, “I love it better when the GRAMMYS are in New York”, drawing applause from the crowd. Other big winners from the evening included Bruno Mars‘ labelmate Ed Sheeran who won Best Pop Solo Performance for smash hit Shape of You and also Best Pop Vocal Album for ÷. GRAMMY Darling Kendrick Lamar won Best Rap Song, Best Rap Performance and Best Music Video for HUMBLE. and his Rihanna Collaboration LOYALTY. won Best Rap/Sung Collaboration. His Disc DAMN. won Best Rap Album. Canada saw The Weeknd win for Best Contemporary R&B Album with his top-selling Starboy Disc, while national icon Leonard Cohen post-humously won for Best Rock Performance with You Want it Darker. Our Alessia Cara won coveted Best New Artist and while her version of How Far I’ll Go didn’t win for Best Song for Visual Media, the Moana Theme sung by Auli’i Cravalho would go on to win.